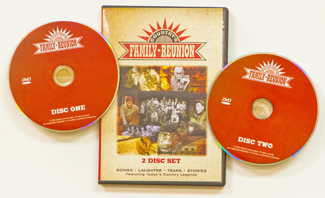 The original Country's Family Reunion taping that started it all! 4 hours on 2 DVDs! The first time our country's family reunion folk ever sat together to share stories and songs. So many of our legends have passed since this taping, but this series includes Grandpa Jones, Billy Walker, Del Reeves, Johnny Russell, Skeeter Davis, Johnny Paycheck, and so many more. Also attending is Bill Anderson, Little Jimmy Dickens, Jeannie Seely, Jan Howard, Leroy Van Dyke, Bill Carlisle, Brother Oswald, and more.